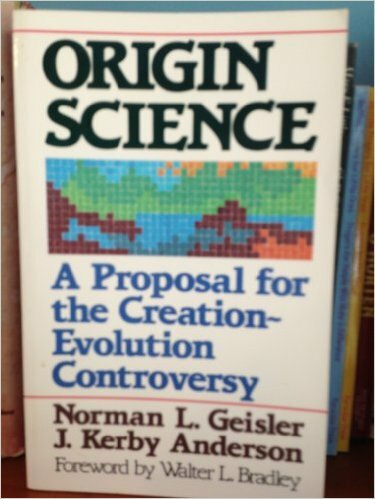 "Origin Science: A Proposal for the Creation-Evolution Controversy" (Amazon, GoodReads, Quotes) by Norman Geisler and J. Kerby Anderson is an older book that recently came to my attention. I have been involved in science/faith apologetics for quite some time, and it took a critique of one of my posts before I was made aware of this philosophical work. I have to admit that I was nervous to read this book, since I highly respect Dr. Geisler, and one of my critics used him against me. When I received the book, I was debating whether I would review it or not, but after reading the introduction, I was hooked and decided that this work was too important to the science/faith dialogs not to review it. This review will follow the usual chapter-by-chapter format of previous reviews, and while I do my best to communicate the content to the readers, this review is not meant to take the place of purchasing the book and reading it for yourself. I will conclude the review with my own thoughts and recommendations. The book is 183 pages, divided into seven chapters and six appendices. Geisler and Anderson introduce the book by making a couple initial distinctions. They offer that the sciences attempt to discover both singular events and regular patterns in both the past and the present. They explain that regular patterns in the present can be discovered via empirical observation and testing (in nature and in the lab). This is called, "operation science." Past regular patterns can be reasonably inferred as long as a theory can be measured against the present pattern (called "historical science"). However, past singularities (origins science) do not result from regular patterns. And since singular past events have no pattern that extends into the present to be discovered, these events must be discovered via forensic science (the same way that a crime scene investigator discovers the perpetrator of a crime). It is important to recognize the distinction; otherwise, the tools used in the realm of operations science will be incorrectly used when attempting to discover the truth in the area of origins science (the focus of the book). Such an incorrect use unnecessarily limits the types of explanations allowed to those that may not be supported by the evidence. It must be noted that in this introduction, the authors make clear that they do not posit that truth about the past (unobserved) cannot be discovered via the sciences, rather they believe that past regularities can be known by examining the present, and past singularities can be discovered by constructing a cumulative case of the evidence and inferring the best explanation (with the same level of certainty that a crime-scene investigator has in their cumulative case for the past [unobserved] singular event of a crime). Geisler and Anderson begin with a quick summary of the history of the creation/evolution debate. 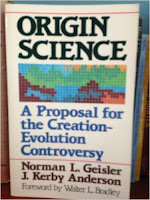 They describe several volleys between the two sides that culminated in the National Academy of Sciences passing a resolution in 1981 that explained that since creationism is merely a religious view and completely unscientific, that it did not belong in the classroom. Geisler and Anderson critique seven pieces of evidence offered against the scientific status of creationism and four pieces of evidence often cited for the merely religious status of creationism. They draw heavily upon and expound the distinction that they made in the introduction to address claims that creationism is unfalsifiable and based wholly on unobservable phenomena while science deals with falsifiable and observable phenomena. The pieces of evidence that creationism is merely religious commit several logical fallacies and are ultimately grounded in the incorrect idea that religion and science necessarily address mutually exclusive realms of reality. To further address such an incorrect idea, Geisler and Anderson describe the early beginnings of modern science. They explain that the Greek idea that the universe was eternal and necessary did not allow for empirical investigation of its features, so modern science did not develop with such a worldview. Rather it was theism that led to the thriving of modern, empirical science. Geisler and Anderson describe the beliefs, motivations and contributions of several founders of modern science to show the significance of the theistic worldview to modern science. Francis Bacon, Johannes Kepler, Galileo Galilei, and Isaac Newton all believed that God created a mathematically ordered universe with constant governing laws and that this universe is discoverable by the human senses and reasoning capabilities. They believed that the regularity of the universe allowed both the present and the past to be discovered. So, the idea that religion and science necessarily address mutually exclusive realms of reality is not only incorrect; modern science is dependent upon the fact that religion and science do address the same realms of reality. In Chapter 3 Geisler's and Anderson's goal is to identify where the reliance upon science to explain everything began. They examine the contributions of several philosophers and scientists who hold such a view. Rene Descartes, George Louis Leclerc de Buffon, Immanuel Kant, and Pierre Simon de Laplace are all put forth as setting the stage for naturalistic approaches regarding the origins of the universe. Each of them held strongly to the reliability of the natural realm to give information if properly investigated. They also believed that if currently observed phenomena are properly understood, that understanding may be extrapolated into the past to discover what has happened in the past. This grew in popularity over the centuries because of its logic and explanatory power, but it necessitated the implication of being able to singularities as regularities, thus removing God from being the cause of the universe. They all, though, made the logical mistake of believing that knowledge of current and past regularities (operational and historical science, respectively) could also be applied to past singularities (origins science). As discussed in the book introduction, the causes of regular events do not limit the causes of singular events to natural causes only. So, the error was in the conflation of historical science with origins science. They applied this misunderstanding to their observations of the universe and extrapolated the view back in time indefinitely. However, with the discovery of the big bang, a hard limit was placed on the ability to extrapolate present observations into the past: the big bang was a singular event that cannot be explained by the same mechanisms that explain regular events. The mistake, though, was not identified while it was only being applied to astronomy. Experiencing a high from the success of this new philosophy of science, more scientists began to apply the philosophy to their respective disciplines. James Hutton and Charles Lyell introduced the method to the geological sciences, and Charles Darwin brought it to biological studies. Since creationist theories spoke primarily to the singular origin of the universe, geological formations, and species, and singular past events seemed to now be explainable via present regular events, creationist theories were completely replaced with naturalistic theories in the sciences. Some even went so far as to say that creationism was not even scientific because of the fact that it posited an unrepeatable, past event. This empiricism was accepted as the only source of knowledge in the sciences, and forensic science was completely rejected as a valid source of knowledge about past events. Further, the acceptance of this error necessarily results in removing all theories of origins (both creationists' and evolutionists') from the realm of science. If one accepts the mistake, they are stuck with the conclusion that no theory of origins is testable (thus the theory is not scientific); conversely, if one accepts this conclusion, it is evidence that they have accepted the same philosophical mistake of Buffon, Laplace, Lyell, and Darwin. It does appear logical that such empiricism is accepted. Geisler and Anderson explain that several more philosophers and scientists argued that since the present is key to the past, there is continuity between the present and the past, and the present exhibits natural, secondary causes, then it is accurate to only look for natural secondary causes for events of the past, thus eliminating the need or ability to posit a singular cause of a past event. This "scientism" is still promoted to this day in the sciences. Unfortunately, these philosophers and scientists have made a grave error. There is a distinction between the principle of uniformity and uniformitarianism. The idea that the present is the key to the past is logical and follows, but it only follows to the point that continuity in mechanism (the laws of physics) with the present is broken (if it ever is). Uniformitarianism assumes that all past events are explainable via natural causes, including the singular events. While the present is key to the past, it is key only to past recurring events, not singular ones. Recognizing this distinction is key to addressing David Hume's argument against miracles. Using our present experience that singular events are only the result of intelligent causes, any identification of a singular event in the past (such as the big bang or the origin of life) establishes that the event cannot be the result of natural causes. So contrary to popular opinion, Hume's argument does not argue against the belief in miraculous events of the past, but rather establishes that belief in miracles is necessary. They further explain that in the recognition of the distinction between the "basis" and the "object" of investigation theories of past singular events can be tested scientifically. Since scientists were having so much success in explaining the present via secondary, natural causes, the idea of uniformitarianism (the idea that ALL events can be explained via the physical laws) stuck in the sciences for quite some time. It was not until scientists discovered that if they worked backward in time (using the principle of uniformity- the present is key to the past) using the presently accepted laws of physics (the basis), that the laws of physics broke down at the beginning of the universe (the big bang creation event- the object). The fact that these laws of physics had been tested and strongly established in the present (the basis) verified that there was, indeed, a creation event (the object) in the past that resulted in the creation of the laws of physics. Uniformitarianism posits that the laws of physics explain their own creation, but that is logically absurd for something must exist to create- the laws of physics cannot create themselves. Thus, by demonstrating discontinuity in the governing laws, the principle of uniformity has been used to demonstrate that uniformitarianism is false. With the fall of uniformitarianism also comes the fall of the necessity of secondary, natural causes to explain the past, singular events. Creation is scientifically plausible, logically established via acceptance of the principle of uniformity and constant laws of physics. Big bang cosmology ushered in a new era for the creationists' seat at the scientific table of ideas. Science had established that creation was a viable, scientific hypothesis that could be tested against naturalistic theories. Using this Geisler and Anderson propose that there exist three primary events in history that creationists and naturalists attempt to explain: the beginning of the universe, the beginning of life, and the diversification of life. They explain how the varying models can be tested via historical science (analogy of the past with the present). It is important to recognize that it is not sufficient for the creationist or naturalist to merely show what is wrong with the competing views, they must provide a positive case for their view. In the case of the creationists, they explain that in each of these areas are evidence of purpose and specified complexity. Since it is observed today that purpose and specified complexity are only the result of intelligent agents, using the principle of uniformity, it is logical to posit that the past events that evidence these characteristics are also the result of an intelligent Creator. Since the naturalist has no observable evidence today of purpose and specified complexity resulting from a non-intelligent source, their positing of such an idea has no grounding science. They conclude their book by emphasizing that science has established the scientific viability of the creationist position, and encourages the creationist to build a positive, circumstantial case for their view. I began this review by mentioning that it came my way by way of a critical review of one of my posts. I also stated that this book was too important to NOT review. Both of those are correct, but not necessarily for reasons that one may think. The book did not cause me to change my view; nor was it critical of my view. Rather it caused me to nuance my view and defend it philosophically against critique. The view that I am speaking of is the distinction between historical and observational science that is often made by young-earth creationists. While a distinction DOES exist, it is not the distinction that they promote. Geisler and Anderson explain how big bang cosmology has opened the door for creation to be a viable and testable hypothesis. The book has prepared me to defend this notion using sound arguments. They do these both quite succinctly in this work. Anyone who is involved in science/faith discussions with skeptics and/or fellow Christians need to get this book and read it carefully. If that recommendation is not strong enough for you, this book is now the first book that I will recommend for anyone involved in these discussions to read before they read any other works. This book is too epistemologically foundational to the science/faith dialog (with both Christians and skeptics) to be ignored. Understanding the distinctions and epistemology described and defended in this book will dramatically help the Christian in their own critical thinking about the origins issue and prepare them to better defend their view against those who disagree. I wish that I would have been aware of this book years ago.